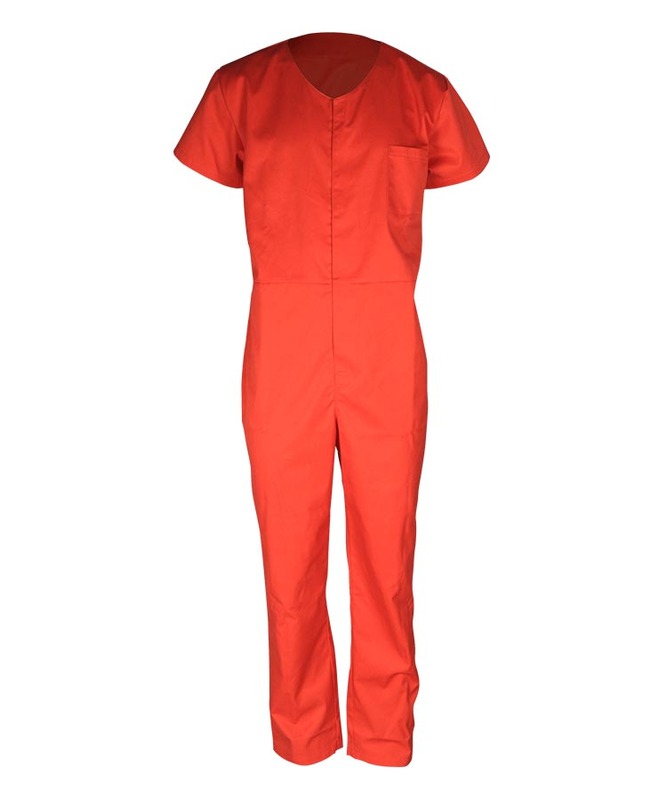 This cotton fire resistant antistatic coverall made of 320gsm cotton fire resistant antistatic fabric, and can meet NFPA70E, EN1149-5, EN ISO 11612, GOST 12.4.221-2002 and other standards. 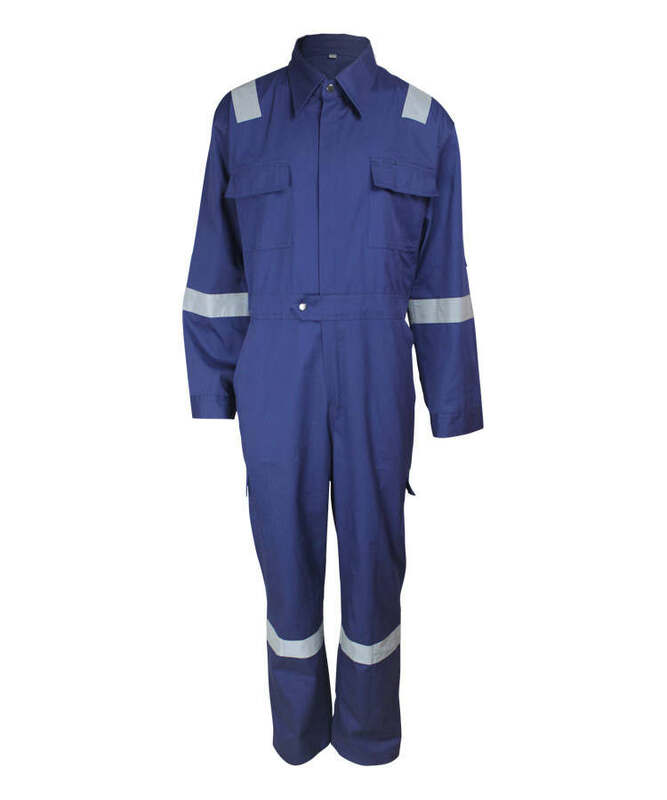 This cotton fire resistant antistatic coverall has the effect of self-extinguishing with no droplets, soft touching, good strength, good wear resistant property. And it has good breathability and suitable used in hot and humid conditions, it can resist more than 100 times washing. 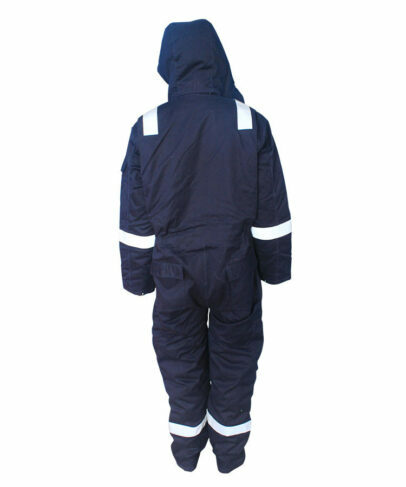 This cotton fire resistant antistatic coverall mainly used in oil & gas and other industry field. Hat linked collar by snap button, you can easily remove or fold into the collar inside, easy to keep warm. There is elastic ribbon adjust tightness in the cap peak, closed by two Velcro,adjustable size, windproof and warm. Two angled patch pocket with flap on chest, double visible stitch, closed by metal zipper. Front opening is closed by two way zipper, to the chest width, three popper on collar and waist, convenient and practical, front zipper wind cover the zipper, windproof and warm. Waist line add 4cm belt, elastic band on both sides can adjust the waist size, made the cotton fire resistant antistatic coverall suitable for more people in different sizes. 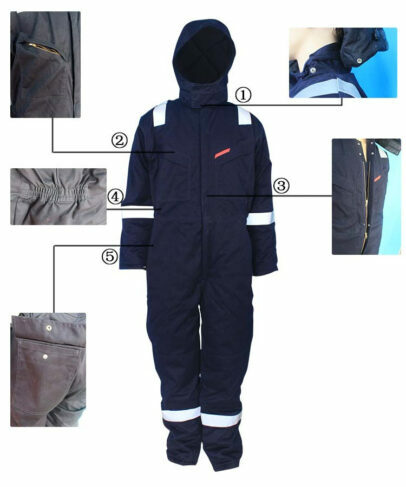 Back pocket with flap,closed by popper, pocket cover is larger than pocket about 1cm, to prevent debris flying into the cotton fire resistant antistatic coverall pocket, hip pocket is double visible stitch patch pocket. 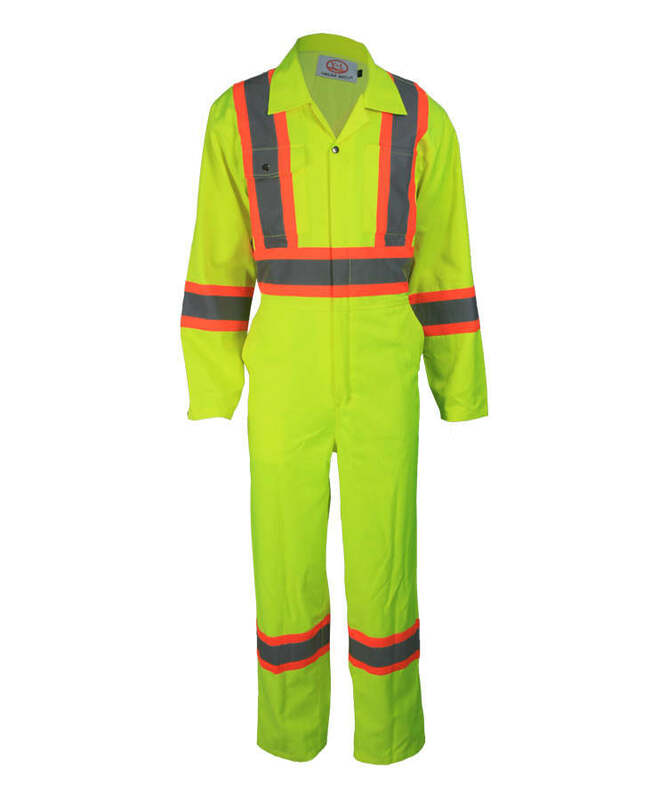 Reflective tape on shoulder, sleeves and legs, single visible stitch,more striking and secure. Active back,easy to stretch the arm. Cuff natural curling, popper closure. Two bottom buttons on cuff can be adjusted according to the different needs of the wearer’s cuff size, convenient and practical. Pants outside seam is stitched double-visible stitches, beautiful and solid. 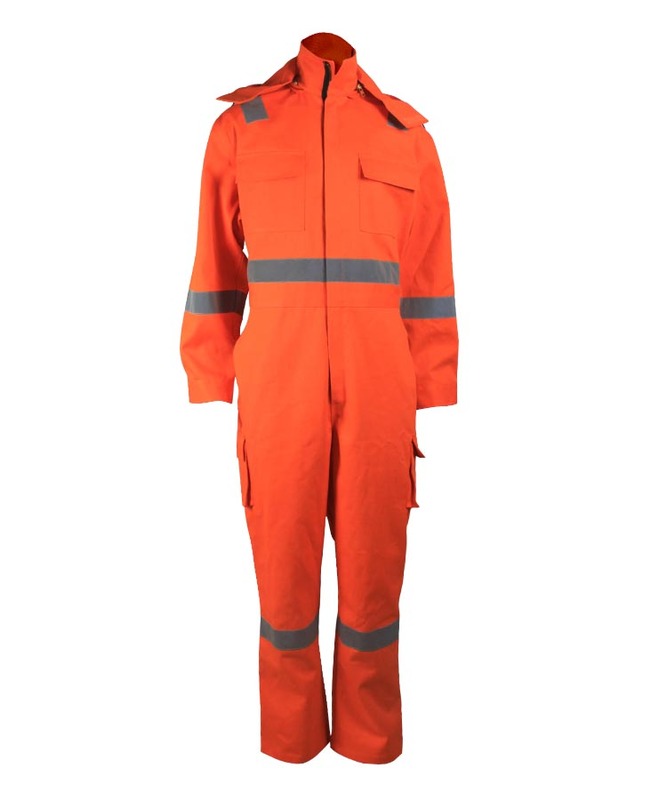 Slant pocket on both side of cotton fire resistant antistatic coverall’s pants,right side on leg is patch pocket with flap. 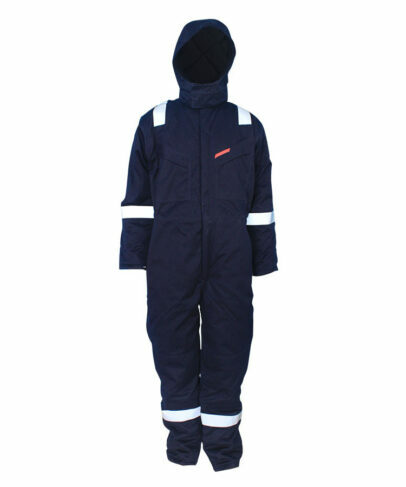 All the cotton fire resistant antistatic coverall with fiber fill,quilted grid lines inside, comfortable and warm. Inside bag on each chest, put important items.